Sphera Cinema Interactive ambient Light system creates a modern environment for moviegoers. Sphera Cinema auditoriums can become a 360° ambient light effect with different lighting for arrival, adverts, trailers, breaks and credits. Sphera aims to offer to the moviegoer a sensorial experience from the cinema lobby to the auditorium. 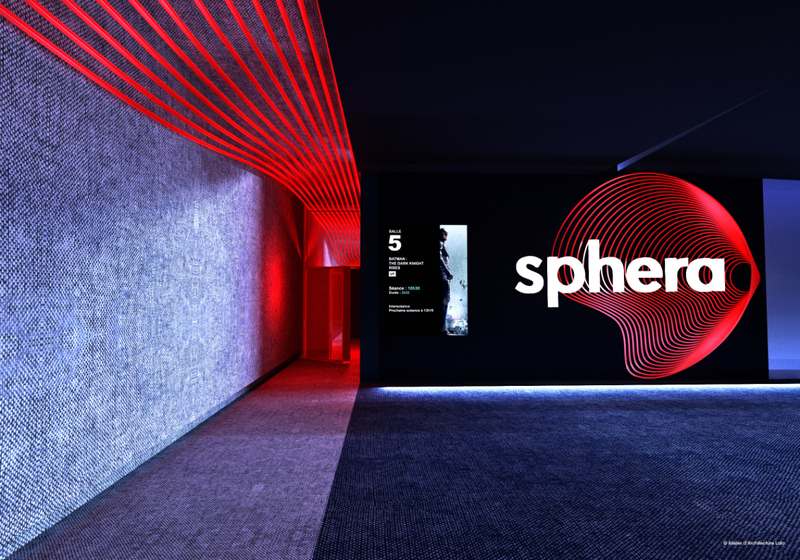 The Sphera experience begins with the immersive hall and continues throughout the entryway to the Sphera auditorium with our LED wall lighting system whose colors and atmosphere awaken moviegoers’ senses for the ultimate visual experience. Sphera’s designers created a distinct interior concept and a unique Eames-inspired seat design, covered with material to reduce reflection. An artistic, dynamic lighting system enhances the overall entertainment experience. It can be programmed to reflect content or mood; building anticipation, adding to the excitement or instilling a relaxed feel. The auditorium can become a 360° ambient light effect with different lighting for arrival, adverts, trailers, breaks and credits.